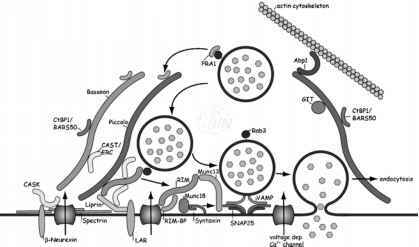 aspects of CNS synapse formation and function. 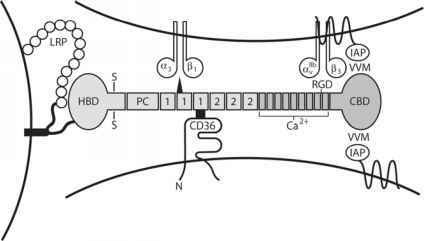 An emerging picture is now forming of which of these proteins and signals are necessary and sufficient for synaptogenesis. Thus, it appears that transmembrane proteins such as the neurexin-neuroligin proteins and SynCAM are sufficient to induce formation of CNS synapses1-3 (Chapters 4,7,8). However, these signals do not act alone. Aspects of synapse formation, stabilization, elimination, and plasticity are influenced by other signals that are either intrinsic or extrinsic to neurons. For example, cadherins, ephrins, neuroligan, Wnts, TGFP family members, neuronal pentraxins, FGF-22, and the ECM molecules have been identified as helping to promote pre- or postsynaptic differentiation in a variety of invertebrate and vertebrate preparations 2,4t-7. Here, we focus on the role of the ECM in aspects of CNS synapse formation and stabilization. Several recent reviews have provided insight into the ECM's role in synaptic plasticity8,9. While ECM molecules have an established and important role in PNS synaptogenesis, the function of ECM in CNS synaptogenesis is relatively poorly understood. Nevertheless, several interesting studies have recently implicated ECM in different aspects of CNS synapse formation and function. TSPs form a highly conserved family of molecules10 and constitute a gene family of five members in vertebrates. All TSPs are extracellular multimeric, multidomain calcium-binding glycoproteins that function at cell surfaces and in the ECM10-13. Their best known functions are to promote cell attachment and to regulate the cytoskeleton, migration, and angiogenesis. Subgroup A TSPs (TSP1 and TSP2) are homotrimeric, whereas subgroup B TSPs (TSPs 3, 4, and 5) are homopentameric molecules. Members of each subgroup are very closely related. TSP5 is only found in cartilage, but there is evidence that the other four forms are expressed at varying times during development in the nervous system. TSP1 is the best studied of the five TSPs. Structurally, TSP1 consists of a heparin-binding N-terminal domain (HBD), a linker with homology to procollagen, three TSP-type-1 (properdin) repeats, three TSP-type-2 (EGF) repeats, seven TSP-type-3 (calcium binding) repeats, and a cell-binding carboxyl-terminal domain (CBD) (Figure 11.1). Its C-terminal domain is associated with adhesive functions, whereas its amino-terminal domain is implicated in de-adhesive functions. TSP2 has a very similar structure. TSP3, 4, and 5 lack the N-terminal domains, procollagen homology linker, and the TSP-type-1 repeats, and display much more restricted expression patterns. Importantly, each of the TSP domains binds to different receptors. In the nervous system, TSP1 and TSP2 have been found to be expressed by astrocytes only during postnatal development14,15. TSP3 has been observed predominantly in embryonic brain. TSP4 is expressed by CNS neurons in adulthood rather than during postnatal development16 and is highly concentrated in synaptic layers in the adult retina and brain, as well as at the mature NMJ. The functions of these TSP isoforms in the nervous system are not known. Figure 11.1. Structure of TSP1 and 2. The molecules comprise distinct domains that in non-neuronal cells have been found to bind to distinct receptors and mediate different functions of the proteins. TSP1 and 2 consist of a heparin-binding N-terminal domain (HBD), a linker with homology to procollagen, three TSP-type-1 (properdin) repeats (labeled as 1), three TSP- type-2 (EGF) repeats (labeled as 2), seven TSP type-3 (Ca2+ binding) repeats, and a cell-binding carboxyl-terminal domain (CBD). VVM-containing motifs in the CBD of TSP bind to integrin-associated protein (IAP). The HBD in involved in interaction with low-density lipoprotein receptor-related protein (LRP) and other proteins (see ref. 10). Among the TSP receptors that are highly localized to synapses in the CNS are multiple integrins and integrin-associated protein (IAP/CD47). Integrins comprise a large family of cell adhesion molecules that mediate interactions between the extracellular environment and the cytoplasm17-19. Integrins are expressed as cell surface heterodimers consisting of a and P subunits. There are 16 different a and eight different P mammalian integrin subunits, which associate to form 22 recognized a P heterodimers. Each integrin recognizes specific ligands, often ECM molecules such as laminin and fibronectin, or other cell surface receptors such as cell adhesion molecules. Recently, it has been found that integrins are localized to synapses, where they participate in synaptic development, function, and plasticity20-24. CD47/IAP is also highly localized to synaptic regions throughout the brain and retina25,26, where its function is unknown. Thrombospondin has recently been identified as a component of the CNS ECM that is both necessary and sufficient to form synapses in vitro and plays a role in synapse formation in vivo. Using purified cultures of neurons and glia, numerous studies have found that neurons in the absence of other cell types can survive and extend robust processes, but they do not form many synapses. Interestingly, another cell type associated with synaptic structures in vivo, the astrocytes, produces soluble signals that can increase the number of synapses on neurons nearly 10-fold27-29. This increase in synapse number is seen when media conditioned over a feeding layer of astrocytes (astrocyte conditioned media) is added to neurons, indicating that the signal is secreted from astrocytes, much as ECM molecules are secreted. What is the identity of this astrocyte-derived synapse promoting factor(s)? One astrocyte-derived synapse promoting signal turns out to be TSP. Evidence that TSP is the astrocyte-derived signal that increases synapses on purified neurons comes from the recent work of Christopherson and co-workers30. These authors found that astrocytes in vivo and in vitro express high levels of TSP1 and TSP2 mRNA. Interestingly, in vitro, TSP2 seems to be the main protein expressed. Is TSP2 necessary and sufficient to increase the synapse number in vitro? Addition of purified recombinant TSP2 to cultures of neurons resulted in a dramatic increase in synapse number, similar to the effects of astrocyte-conditioned media30, indicating that TSP2 is indeed sufficient to increase synapse number (Figure 11.2A; Colorplate 8). To determine if TSP2 is a necessary signal from astrocytes for their synapse-promoting ability, TSP2 was removed from astrocyte-conditioned media with a TSP2-specific antibody. TSP2 depletion almost entirely eliminated the synapse-inducing activity of astrocyte-conditioned media. These findings taken together indicate that TSP2 is sufficient and necessary for astrocyte-conditioned media to induce synaptogenesis between retinal ganglion cells in vitro. TSP1 had a similar synapse-promoting effect as TSP2 and appeared to be expressed in vivo3 0. Therefore, it is likely that both TSPs play a role in synap-togenesis in vivo. To determine what role TSP1 and TSP2 play in synaptogenesis in vivo, the recently generated TSP1 and TSP2 double knockout (KO) mice were analyzed. Analysis of double KO brains found a 30% decrease in synapse number at early postnatal ages (P5-6) and this reduction in synapses is maintained into adulthood30. Interestingly, no significant effect on synapse number was seen in the TSP1 or TSP2 single KOs. This indicates that both TSP1 and TSP2 are required in vivo for normal synapse formation or stabilization. Because of the high homology of the TSP1 and TSP2 orthologs, it is likely that they can serve redundant functions in the nervous system, each being able to regulate synaptogenesis. How do TSP1 and TSP2 regulate synaptogenesis in vitro and in vivo? One interesting property of TSP is its ability to regulate function of other adhesion molecules. This raises the possibility that TSP functions by regulating the adhesiveness or signaling of other proteins already implicated in synapse formation, such as neurexin-neuroligin or SynCAM. Whether TSP1 and TSP2 function by regulating such molecules and how these TSPs send signals to neurons has yet to be determined.